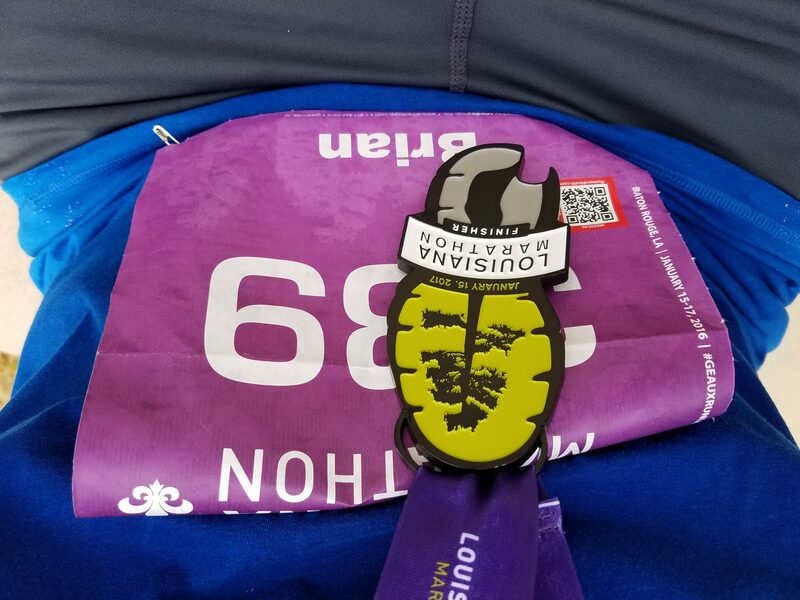 After months of training, I got to take my shot at the full 26.2 miles of the Louisiana Marathon and I finished it. My first marathon, it was one of the hardest physical things I had ever done before in my life. Those last six miles were brutal, breaking down into longer and longer periods of walking and shorter and shorter periods of running. My legs-my entire body-ached, but not so bad I couldn’t move. Hell, I even ran up that god-forsaken overpass in the last couple of miles. I just felt like I ran out of gas, literally like a combustion engine trying to run on fuel fumes. I think a few things contributed to this. First, I tried running a slightly faster pace than what I trained for, which is always a mistake, but I kept it up for 18 miles or so. I finished my training schedule more than a month early (You can read about that here.). While I did my best to maintain my conditioning, the weather, the holiday food and booze, and family concerns worked against me. And the race day temperature started in the mid-60s and got into the low 70s with some humidity, so it was significantly warmer than it had been for any of my long runs. I also knew some friends and coworkers that ran into their own problems. One fell down early in the marathon and scraped up her hands and knees pretty badly. Another pulled a muscle around mile 19, but had been running at a pace fast enough that he had time to limp the rest of the way home before the sweep bus came along. So, my finish time wasn’t great, 5:20, but it was still a finish time. And I have the medal to prove it. After running that thing, just the accomplishment of doing it is enough for me (for now). 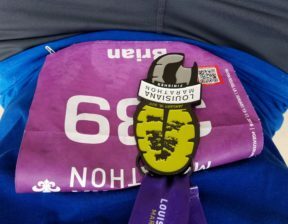 Louisiana Marathon 2017 medal, a cypress shoe. Covered in body salt (and probably stinking terribly), I made it to the victory party with plenty of time to spare. 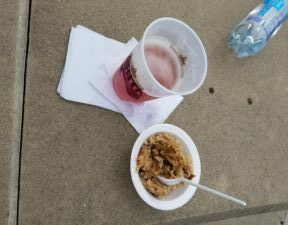 There was a variety of food from several different vendors. Most of it was just free and didn’t require using one of the six stamps on my event bracelet. The Abita Brewing Company was out there with its trucks serving up its most popular beers. I had a Purple Haze, but there was also the Amber and The Boot – Louisiana Exclusive. It’s all pretty good beer, but after chugging a gallon mixture of water and powerade for the last 5 hours, my stomach wasn’t quite ready for beer or food. Still, I had what I could stand out of principle, at least until I got back to my car and stopped at Jack in the Box on my way home. Eating an Ultimate Cheeseburger meal has become my post-marathon and half-marathon tradition it seems. 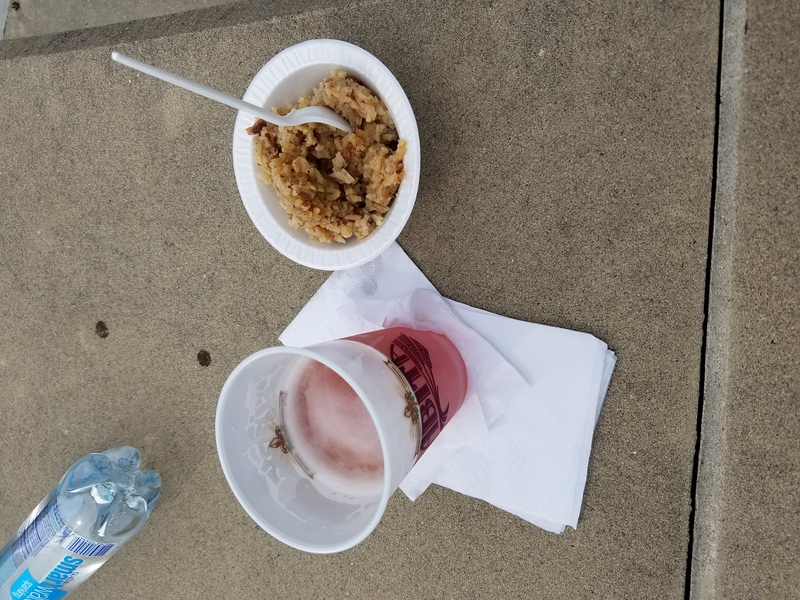 Post-marathon #Abita Purple Haze and a bowl of jambalaya, tasted like bitter, awful, God I felt like I was going to die victory, but victory nonetheless. I wish I had my own pictures of the course itself, but I didn’t want to fumble with my phone while I was concentrating on staying with the pace team. The first half is great, aside from some rough roads. It goes from downtown Baton Rouge to Tiger Stadium on LSU’s campus by way of the streets around the LSU/Baton Rouge Lakes. This is obviously a matter of (completely biased, damn those last 10 miles!!!) opinion, but the second half of the route was just kind of plain. You were running through neighborhoods. I had more than my fill of that during my training. It was psychologically disheartening in a way. Still, there were tons of spectators and police officers and volunteers along the either leg to cheer you on. People dressed in Batman and Super Troopers costumes shouted for us to keep going. Others offered us snacks and drinks and funny signs reading things like, “I don’t run marathons. I watch them on Netflix.” And the pace guy I ran most of the race with, as well as most of the runners, waved to and thanked each of the officers we passed. It was a good show of solidarity after such a rough year for the state. With the marathon over and the training (thankfully) behind me, I’m turning my focus back to writing now. But really, writing a new book is just another kind of marathon. That’s depressing to think about right now, so I’m just going to stop. If you’re curious, you can view the 2017 Louisiana Marathon results here.